No need to prepare your dessert before dinner. 30 seconds in the microwave and this treat is ready to enjoy! Thank you to our Featured Foodie, Real Mom Kitchen! 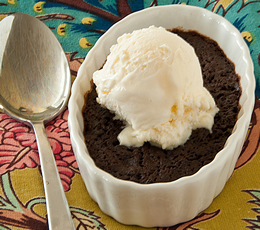 In a mug or small microwave safe dish, add the coco powder, flour, sugar, water, oil, and salt. Microwave for 30 seconds. Serve warm with a scoop of ice cream.